Kieran Agard got his second goal in as many games to see off a lacklustre Peterborough at the ABAX Stadium 1-0 to all but confirm their spot in the second round of the Checkatrade Trophy. Agard's goal, coming five minutes before the break, was fully deserved as the home side looked distinctly uninterested for the large part. In a competition Karl Robinson dubbed 'rubbish' earlier this week, he made seven changes to the side to face Peterborough. The only survivors from Saturday's 2-0 win over Oldham were Paul Downing, Samir Carruthers and goal-scorers Ben Reeves and Kieran Agard. 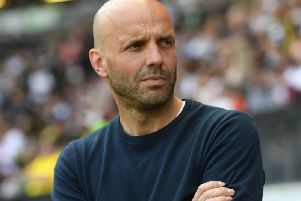 With George Baldock out injured, GB Williams returned at right back, while Jack Hendry, on loan from Wigan, was handed his debut in an MK Dons shirt. In a frantic opening 15 minutes, both sides had decent sights of goal but it was Posh who had the better chances. George Moncur struck into the side netting early on, as Marcus Maddison forced Lee Nicholls into a save too from close range. At the other end, Brandon Thomas-Asante's industry was key for Dons as he twicefired close to Luke McGee's goal. But his efforts just before the half hour mark allowed Ben Reeves to get a shot off from the edge of the six yard box, forcing the Peterborough keeper into a good save which rebounded off his body and narrowly over the top. With the visitors playing the better football, they just about deserved to be ahead when they found the net with five minutes to go before half time. Breaking four-on-three, Thomas-Asante held the ball up well for Carruthers to break down the left, duping keeper McGee into a dive, only to pull it back for the unmarked Agard to tap into the empty net. Seemingly keen to put the game to bed early, Dons burst out the box in the second half and forced the issue. Thomas-Asante was once again at the heart of it. He forced McGee into a save but probably chose the wrong option in going it alone as he had Agard and Ben Tilney to either side of him, and Bowditch too made the keeper work as he cut in from the left flank. The home side, at times, barely looked interested in the match, let alone the result. While Dons were playing some exciting stuff, Peterborough looked happy to see the result out. But with 20 minutes to go, they began to show a bit of heart brought on in part by the departures of Reeves and Agard in the Dons attacking line. But Giorgio Rasulo, who replaced Reeves, should have put the game to bed when the ball fell to him barely 10 yards out, but opted to place it rather than put his foot through it, allowing McGee to save. Peterborough were almost back in it when they had calls for a penalty turned away as the ball struck Paul Downing's hand from close range late in the day, but Dons would ultimately take the comfortable win, with it booking their spot in the second round with a game to spare.